Photograph: These shallow water coral heads are growing seaward of the reef margin east of Andros Island in the Bahamas. This is home for a variety of invertebrate species including branching and head corals, calcareous green and red algae, and sponges. Photo taken off Andros Island in the Bahamas by Christopher Kendall. Globally, approximately 10% of all modern carbonate production occurs within shallow marine settings. Between both deep and shallow water environments 60% of the total carbonate accumulation is derived from reefs. Organism production rates vary depending on specific individuals, but provided ambient conditions are ideal (i.e. salinity, temperature, water depth, etc. ), mean productivity rates range between 2 mm to 9 mm per 1000 yr (Kendall and Schlager, 1981). Calculating the amount of sediment produced by modern carbonate secreting organisms, and factoring in observed effects of position and depth on growth is used to determine these accumulation rates. Caution suggests that with respect to growth potential consideration should also be given to lateral progradation of reef sediments as well as their vertical accretion within the sedimentary record (Hardie et al., 1991). Not only is carbonate accumulation dependent on ambient water conditions but also location across a platform. 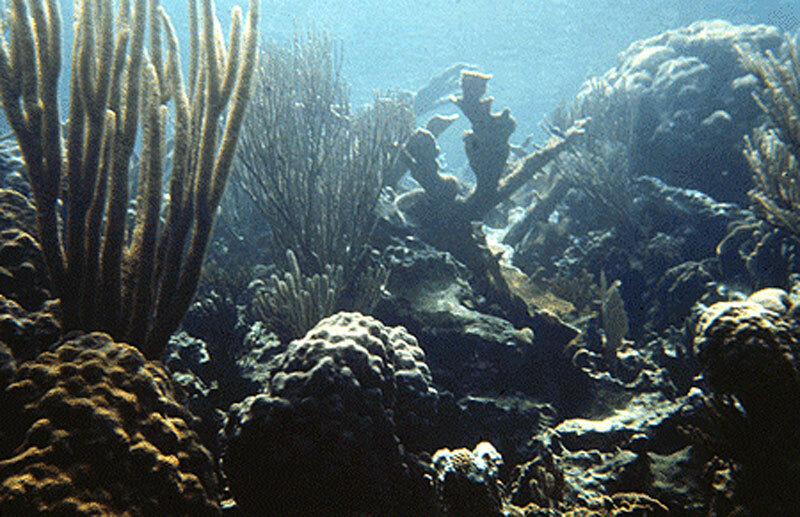 Typically lagoonal and back reef areas have recorded accumulation rates of between 0.2 to 0.4 m per 1000 years (Florida Keys, Boescence, 1989). These accumulation rates are lower than mean platform accumulation rates and are interpreted to be caused by lower nutrient inputs and possible high salinities and temperatures. Likewise, deeper ramp accumulation rates also reflect less than ideal growth conditions and result in an average of 0.1-0.2 m per 1000 years growth potential (Boescence, 1989). To the contrary, accumulation along the reef front is bolstered by high nutrient delivery and subsequently growth rates can be as high as 6 m per 1000 years (Boescence, 1989). Most modern examples of carbonate accumulation quantification stem from both the Bahama region, and the Great Barrier Reef. Accumulation rates for the Florida Reef Tract are unusually high and are over 3-6 m per 1000 years. Maximum thickness over this interval is 14 m, indicating accumulation rates were 2.3 m per 1000 years. Modern mean productivity rates allow for accumulation of 0.5-1.5 m per 1000 years . Ancient examples of carbonate accumulation rates are low when compared to the modern mean. For instance in the Bahama Platform only 4km of carbonate has been accumulated from the Upper Cretaceous (100 Ma ago). This indicates a net accumulation rate of only 0.04 m per 1000 years. A similar example is to be found for the Permian of western Texas from which an accumulation rate of 0.05 m per 1000 years has been determined. Initially the determined 2x orders of magnitude differential between ancient and modern warm water accumulation rates is disconcerting. Upon further examination, however, this apparent discrepancy in accumulation rates can be explained by the fact that ancient carbonate sections represent only a small portion of geologic time. Breaks in the sedimentary section represented by surfaces within them thus may, and often are, representative of long periods of time within which active deposition and erosion (via sea level fluctuations and subaerial exposure) undoubtedly lead to mis-calculated accumulation values (Wilkinson et al., 1991). Thus for sure we can identify the order in which carbonate layers accumulated but will tend nearly always underestimate the time involved. "Nowhere in the world is the record, or even part of it, anywhere near complete. Even in the Grand Canyon of the Colorado River and the adjacent sections along the Little Colorado River, surely the finest record of geological history anywhere on Earth, there are huge breaks. Notable is the complete absence of the Upper Carboniferous (Pennsylvanian) and of the Ordovician and Silurian Systems. Devonian strata are only present in local lenses...." ("The New Catastrophism", by Derek Ager, 1993, p. 14).